Ferry: The Calmac ferry terminal is based at Mallaig, and ferry leaves once a day, except on a Wednesday (summer timetable). On a Saturday there is an extra afternoon ferry at 2.25pm which is the most popular. There are a variety of B and B’s and a Backpacker’s Hostel if you want to travel up the day before and enjoy some time in the fishing port of Mallaig. The summer timetable is from end of March to end of October. You can also get the smaller Shearwater ferry from Arasaig between May and September. Train: leave your car at home and enjoy the scenic train ride on the famous West Highland Line! 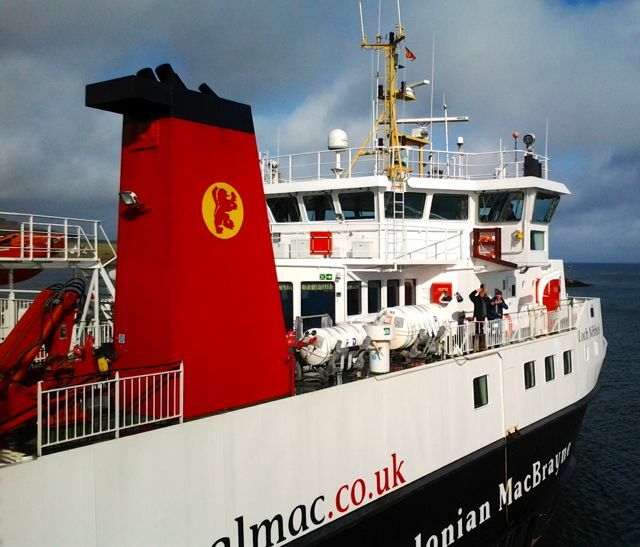 On a Saturday, the morning train links up with the afternoon ferry - train leaves Glasgow at 08.21 am, arrive at Mallaig at 1.30pm – with plenty time to catch the ferry. On a return journey, train leaves Mallaig at 4.05pm, arriving Glasgow at 9.30 pm. Car: Mallaig is about an hour’s drive from Fort William on the A830. The total car journey time from Glasgow is about 3 to 3 1/2 hours, and from Edinburgh about 4 to 4 ½ hours. From Aberdeen it is about 4 hours drive via Inverurie and Kingussie. Visitors are not allowed to take their car onto the island - there is a public car park in Mallaig, where you can leave your car.